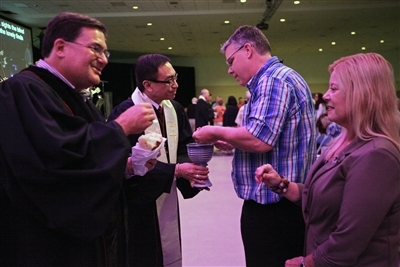 LAKELAND – Reminders that the Florida Conference represents a diverse group of worshipers – young and old, different races and ethnicities and widely varying backgrounds – continued from the 172nd Annual Conference opening session into communion Wednesday. Florida Conference clergy members administer the sacraments during the Service of Word and Table at the 172nd Annual Conference. Photo by Cindy Skop. A contemporary band, led by worship leaders Jeremy Hearn of First UMC, Lakeland, and Michelle Weger of Grace Church, Cape Coral, brought the communion worship service assembly of about 1,000 to their feet in prayerful praise. Rev. Catherine Fluck Price called the congregation to worship and Rev. Clarke Campbell-Evans called them to generosity, saying the offering was for scholarships for theology students at the Institute of Peace, Leadership and Governance at Africa University and the launching of the Young Adult Missional Movement. Churches and members had given nearly $51,000 by the end of the evening. Luke 10:25-37, recounting the parable of the Good Samaritan, was read in Spanish by Rev. José Nieves; the English translation was shown on two video screens. Bishop Ken Carter, wearing a black robe and a white stole, suggested that individuals and churches alike, like the lawyer, may be looking for a loophole. Samaritans, explained Carter, were descendants of Jews who intermarried with people of Samaria during the exile and who didn’t return to Jerusalem. They were looked down upon as compromisers, considered enemies and were ill-treated. Carter drew laughter from the congregation when he referred to a trip he took with his wife, Pam. 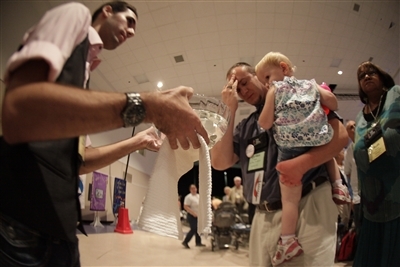 Hundreds of United Methodists remember their baptisms with water and tokens at the opening worship service of Annual Conference 2014. Photo by Cindy Skop. Getting serious again, he said that “Your life for me” means terrorism, shootings, greed, bullying, taking away people’s dignity and profiting from others’ suffering. “What’s true for individuals is also true for churches and denominations,” the bishop said, adding that some churches want more people, more money, more of people’s time — to help the church. Some churches turn inward, like unreachable islands in areas of great need. -- Barbara Routen is a freelance writer based in Brandon.